Safely store a variety of knives for your catering business or traveling chef with this Choice 17 pocket knife bag. This knife bag features nine large pockets for chef knives or carving sets and eight smaller pockets for pairing knives, skinning knives, and other handy utensils. Made of cut-resistant nylon, this heavy-duty knife roll is perfect for all chefs, from budding culinary students to the seasoned executive chef! BIG chef's roll, with plenty of real estate for knives and gadgets. Best you'll find anywhere near this price point. No D-rings for a shoulder strap, but you could easily add some if that's a requirement; like I said, for this price it's a no-brainer and definitely worth modding. My only real complaint is that the handle pockets aren't quite big enough for my Dexter DuoGlide 8" chef (admittedly, it's a monster; the handle ergos are supposedly designed for people with arthritis). I bought this as my first real knife case. No more knives wrapped in towels in my tool box, lol. I like that it long enough to fit large slicing and sashimi style knives. It is lightweight and the straps are easily adjusted as you add more knives. Great for beginners and those looking for an economically priced one for work or school. I really like this bag! It hold any knife that you could every need, and it has enough room to bring other tools as well. I LOVE the buckles compared to cheaper bags and rolls with velcro! i wasn't actually super happy when i saw this bag in person - it was much bulkier than i thought it would be and i don't like how my tools fit in it. i wanted to send it back but there was a restocking fee for this item that, along with the shipping, would have used up most of my refund. When i started my classes in 2016 for culinary i needed a knife bag and the mercer bag was way to expensive. So i decided to try this bag out. its 2018 the bag is great, it fits all my knifes and spatulas. I use it eevryday. Excellent value for the money. Holds a lot of tools! You can actually fit several smaller tools per pocket in some cases. My knives each have a sheath so having them move around hasn't been a problem. The adjustable straps to close it are great as I keep putting scoops and other bulky items in mine. Very happy with the purchase. Really great knife case and seems pretty heavy duty. Can hold a lot and I love the layout of it when you open it. Holds everything nice and snug. This 17 pocket knife case is perfect for most cooks and chefs , plenty of space for most knifes used in a kitchen. It feels very durable and looks very slick perfect for a cook. The case has one section for mainly long knives and one section for tools such as peelers, zesters and paring knives. I purchased 5 of these to safely store our cutlery in the commercial classroom. They are able to be stored on hooks on our shelves. The knife rolls are large and slightly heavy. Depending on the size and thickness of the knife handles, these may be a good choice for you. I bought one of these rolls for myself and two others for two of my chefs. All of us were satisfied with this item. 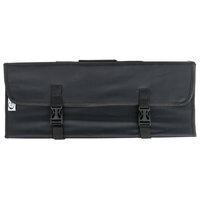 The pull straps come lose rather easily, but overall this is a great knife roll. good for less same one they sale on other site for more . very nice but you have to know how put your knife in before you complaint. This knife bag holds my knives very well. It is huge when opened as it can hold a maximum of 17 items. I really like this knife bag considering that I have a lot of tools that I used in the kitchen. I have over 20 knives for cooking classes, and packing them in this case with some guards is perfect. 6": chef knives and I can fit one in each pocket. Rolls well and clip closures are strong. Perfect size for convenience. Great bag for a very affordable price! Honestly i was a bit skeptical about purchasing this bag just because it wasn't a big name, etc. but It definitely does the job. I love all the space i have to expand my kitchen arsenal and am excited to see how much i can stick in it. My real only complaint is that I found the pockets for the larger knives are a tad looser than what i was expecting so occasionally my chef knives will slip up and are out of the pockets a bit, but other than than great bag! The Choice 17 Pocket Knife Case is a great case. I will never fill even half of the pockets, but for the price, who cares. The case is very well made and even holds the Victorinox 12" Cimeter with no problem. The material is heavy duty, cut resistant and looks great. Great fit, for all my kitchen tools. My only complaint is that there is no strap, so it makes the case a little harder to carry around. I have had this kit for about a week, used commercially, and I am extremely happy! I upgraded from the 10 slot knife roll and this is definitely an improvement! It fits all the equipment I need, even my new cleaver. For the price, it's a steal. Highly recommended! This is one of my best buy. All my knives and garnish tools fitted perfectly in just one case. This is very affordalble for the great material and all the pockets that it has. Just what i was looking for my cooking clases. Very durable. The price is Great! But I still feel weird about the blades moving around so much. It's really just not a pretty as the photos posted. But I do suppose edge protectors could remedy the problem. The pockets all feel too large to comfortably keep hold of a paring knife or a small utility handle. I had to put them together in the same pocket. The whole case honestly feel a too large when opening on either a dinner table to a kitchen counter. 4 stars because it will still hold a great number of tools, the awesome price, and that the bouncing knife edge problem can be solved with edge protectors. Thank you for your review! Blade guards would be a good option if you are worried about the knives moving around too much. This knife case is a great, economical option. If you are looking to upgrade, try the Mercer M30429M triple-zip knife case instead! For the price -this is not a terrible buy. The left strap had apparently begun to tear at some point during or after the construction of this case. Someone thought it sufficient to simply melt the pieces of the strap back together. This was ineffective to say the least and the strap failed at first use. I took it off entirely and replaced it with industrial Velcro and super glue. It's okay now but remember, you always get what you pay for. Thank you for reviewing this item. This pocket knife case is a great value. If you are ever unhappy with a purchase, please feel free to contact a Customer Solutions Representative. Perfect size for my knives.. Even holds a 14 inch bread knife. Also very affordable and durable. Easy to close and open with flip up cover over knives. This case is very large and the quality is good. My 10" chef and slicing knives fit in it with no problem. The knives do tend to move around a little. I recommend using it with edge protectors to keep the knifes from sliding into each other. I had previously just had a smaller roll that I got with a knife set when I started school and I had run out of room! Now I have enough space to store the other small hand tools I use on a regular basis as well as my knives. It is very well made and have gotten complimented on how "professional" it looks. This knife roll is the best that I have ever owned in my life. I am a kitchen professional and I have used and owned 1000s of products on the website in my life and I have to say that for the price of this roll, it's 100 percent worth it! Buy this product! The 17 pocket knife case is attractive and very inexpensive when compared to other knife cases. Very durable with strong clips, should last quite a long time. The quality of this case is quite good. The clasps seem sturdy and the case overall is pretty nice. The only issue is the size of the "pockets" inside. They are all fairly large, so they dont hold on to smaller knives very well. Works great for larger knives though! Case is great when traveling. I would recommend using edge protectors for you knives, you don't want your knife edges banging together especially after sharpening. See my photo. I just LOVE this knife case. I can carry all my knives at the same time and still have room for other stuff! Its great! This knife case is great! I love that there are 17 pockets, it's really useful when traveling with all my knives and tools. I love this thing. This case is so great to carry my knifes from place to place, its also been holding up very well!! Such a great deal! like always! This seventeen pocket knife case is great. I can carry all of my knifes and tools in it and doesn't bend anything. It's very durable. I prefer to use my own knifes at community events and at friends houses. This is a great case to carry many knifes back and forth safely.